Newport RI Wedding - Celebrate your special day in the "City by the Sea"! Celebrate your special day in the "City by the Sea"
Newport Rhode Island has become one of the best wedding destinations in the nation for good reason. Whether you want to be married in one of the Gilded Age Newport mansions, on a cliff overlooking the breathtaking Atlantic coastline, or right on the beach itself, Newport is the ideal location. In addition to the many great venues for your ceremony and reception, this historic city will offer you and your party an unforgettable experience. Also known as "The Sailing Capital of the World" and "America's 1st Resort", Newport abounds with activities and attractions for your family and friends to enjoy during their stay. There are so many amazing wedding venues to choose from for your Newport RI wedding. But which one is right for you? If you like the idea of having a grand reception in the ballroom of one of the Newport mansions, then you might want to consider Rosecliff. 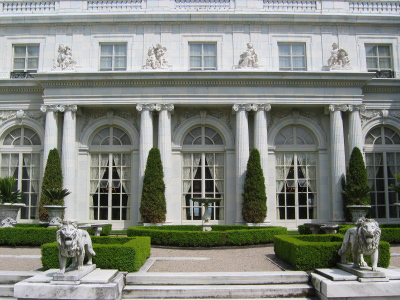 Rosecliff may look familiar to you if you've seen The Great Gatsby or True Lies. Portions of those movies were filmed here, and it was in Rosecliff's 40x80 foot ballroom where Arnold Schwarzenegger did the tango with Tia Carrere in True Lies. Rosecliff is available to be rented for weddings, rehearsal dinners and other events. It's situated on historic Bellevue Avenue, with beautiful views of the Atlantic Ocean from the back lawn. 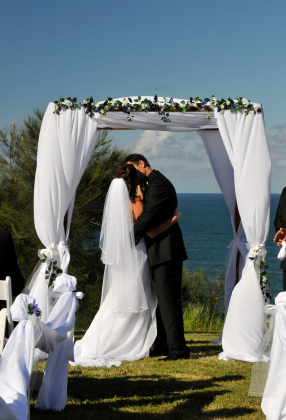 You can have your ceremony on the lawn overlooking the ocean, and then just walk a few steps up to the house for your reception. For more information on Rosecliff, contact the Preservation Society of Newport County at 401-847-1000. If you want to have ocean views for your Newport RI wedding, then locations such as Castle Hill Inn & Resort, OceanCliff, The Chanler or Belle Mer may be more suitable. Three of these locations overlook the Atlantic Ocean, and have sweeping back lawns that are perfect for holding ceremonies, receptions and rehearsal dinners. The fourth, Belle Mer, is situated on Goat Island in Narragansett Bay. It is surrounded by water, with great views of the bay and Newport Harbor. 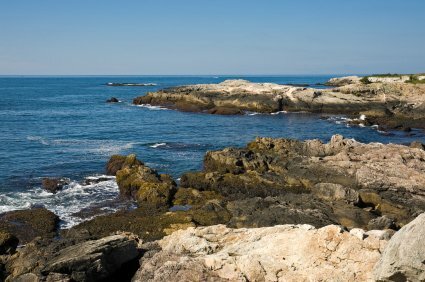 The Chanler is conveniently located just blocks from downtown Newport. It is right at the beginning of the Cliff Walk on Memorial Boulevard, overlooking 1st Beach. Castle Hill and OceanCliff are located out around the Ten Mile Drive (just Ocean Drive or The Drive to locals). 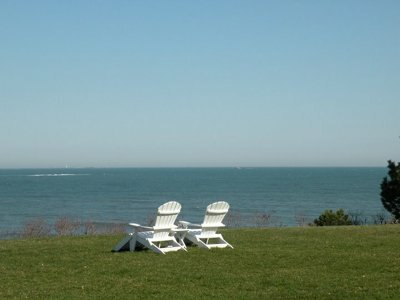 They enjoy stunning views of Narragansett Bay, with cool ocean breezes and many sailboats and yachts passing by. If you like the idea of having your Newport RI wedding right on the beach, you can do that here as well. Easton's Beach Rotunda and the Atlantic Beach Club are the two venues that are located right on the beach. They happen to be very close to each other, since they're both on 1st Beach. They're far enough apart though, that even if events were going on simultaneously at both, you wouldn't be disturbed by each other. 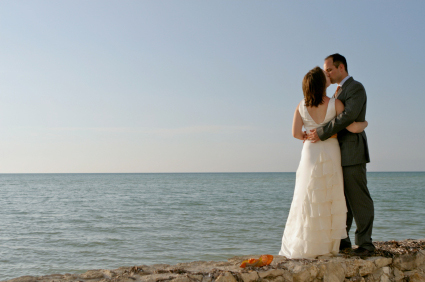 Both of these locations are ideal because you can have your ceremony and photos taken right on the beach if you like, and then the reception can be held inside the facility. 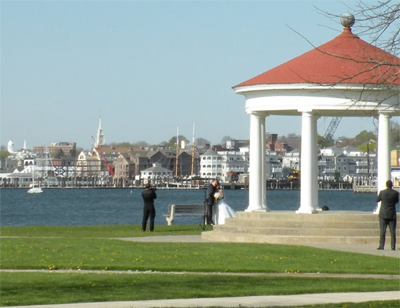 Why not have your Newport RI wedding in one of our city's historic sites? 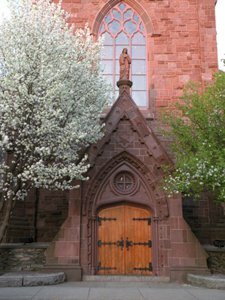 There are a number of beautiful old churches here, including St. Mary's, where President John F. Kennedy and Jacqueline Lee Bouvier were married in 1953. 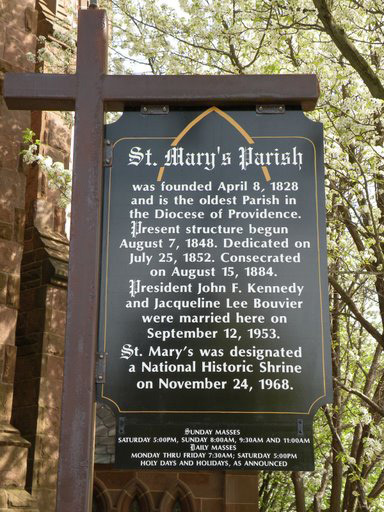 St. Mary's was established in 1828, and is the oldest Catholic Parish in Rhode Island. For more information, call 401-847-0475. Another great historic location to have your Newport RI wedding is the Eisenhower House. This was the summer home of our 34th President, Dwight D. Eisenhower. This is a great spot not just because of its history, but because of its ideal location. 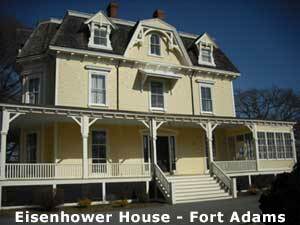 Eisenhower house is situated on the property of Fort Adams State Park, where it has great views of both Narragansett Bay and Newport Harbor. Although the house itself only seats 50 for a sit-down dinner (85 for cocktails), you can have 500+ guests outside under a tent. To inquire about holding your event here, call 401-847-6740. At some point, we'll do an entire page and directory devoted to the many different service providers you'll need for your Newport RI wedding. For now, we'll highlight some of the best for you. 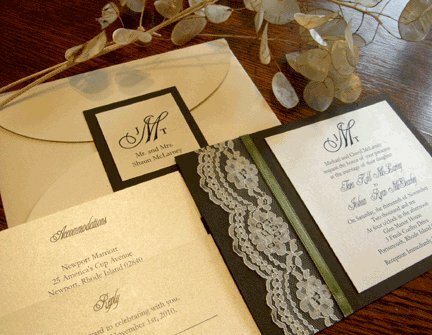 Sweet Pea Print is passionate about making your invitation, thank you note, holiday card, announcement, event stationary, etc., custom and unforgettable. If you're planning your dream wedding in Newport, contact Samantha today and let her work her magic for you! 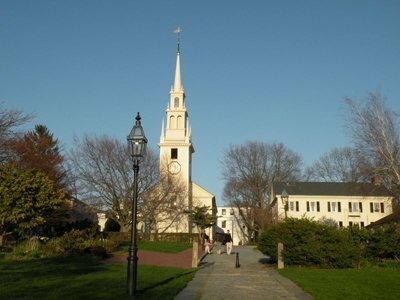 Newport is home to many historic churches, including St. Mary's Roman Catholic Church, where President John F. Kennedy was married to Jacqueline Lee Bouvier in 1953. 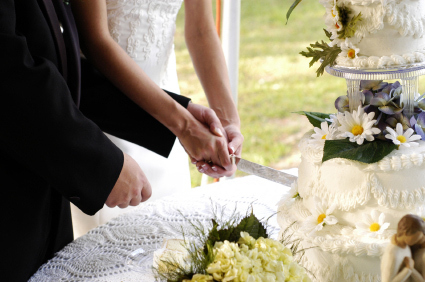 Having a good caterer is crucial to the success of your special day. You need more than just mouth-watering food. You need proper planning and outstanding service as well. Having worked for Blackstone Caterers for many years, I can tell you that they are the best (obviously my biased opinion-but ask around), and you'll be in great hands if you choose them. They can handle any event, from a 1000 guest corporate function at one of the Newport mansions, to a 50 guest wedding reception at a private home. Blackstone is one of the preferred caterers for the many weddings and corporate events held at the Newport mansions, and just about every other venue they work. In addition to having a great venue and caterer, the look and feel of your Newport RI wedding must be up to par as well. You'll need the right floral arrangements and decor to pull this off. One of the reasons for having a Newport RI wedding is the fantastic photos and videos you'll be able to shoot here! You shouldn't have any trouble finding a scenic backdrop for your shoot. Whether you're at one of the opulent Newport mansions, out around the Ocean Drive or right on the beach, the scenery is there. Now you just have to find the right person to take them for you. 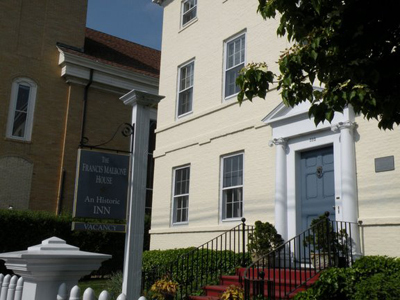 One of the many things Newport Rhode Island is known for is its first-rate accommodations. You'll have a great variety of accommodations to choose from, depending on what suits your party's needs. You can take over an entire bed & breakfast, a group of suites at a historic hotel or rent a house overlooking the ocean. Just be sure to make your reservations early! The spring, summer and early fall seasons are the busiest here. View our accommodations page for more information. Get some great ideas for your Newport RI wedding at The Newport Bridal Show, the biggest bridal event in the state, is a great event that is held yearly here. 2011's show will be held on Saturday, February 19th, at both Rosecliff and OceanCliff mansions. Here's a map showing the best Newport RI wedding venues. Zoom in on each placemark to get a better idea of the location of each spot. 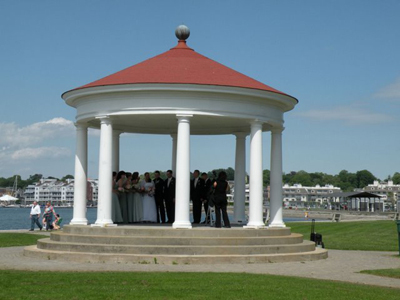 Your Newport RI wedding is sure to be a lovely, memorable occasion. 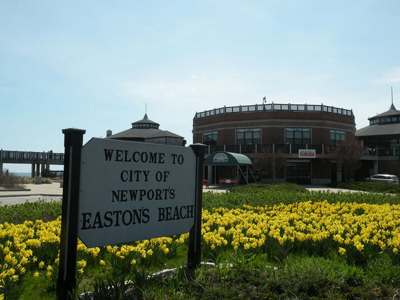 In addition to celebrating your special day, your family and friends will surely enjoy Newport's beauty and charm. You couldn't have picked a better place!